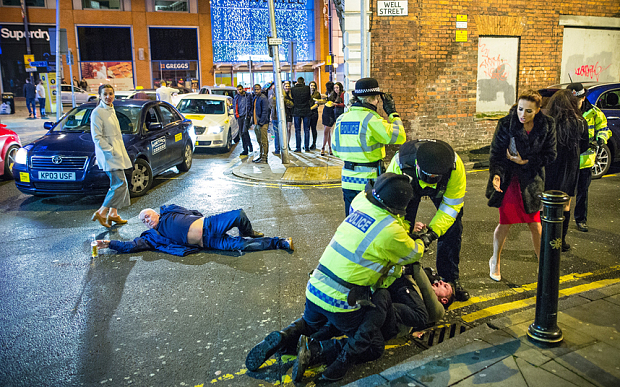 This photograph, by Joel Goodman, went viral after Roland Hughes, Senior Producer for BBC World News and website came across the frame on Manchester Evening News’ website and tweeted the image, commenting; ‘So much going on this pic of New Year in Manchester by the Evening News. Like a beautiful painting’. The image was bought to my attention on Facebook in an article by the Guardian. The following day, the Jeremy Vine Show on BBC Radio 2 dedicated a whole feature to the photograph. The image has since been shared thousands of time across social media platforms. It seems that people’s reaction to the image differ vastly from one and other. Some compared it to the paintings of Hogarth, Caravaggio and Lowry. Many commented that the image had a perfect composition due to the light, colours and golden ratio applied to the frame. Some even suggested that this image may boost tourism in the English city. On the other end of the spectrum, people have expressed concern for the vulnerability of those photographed in such a state. Others have expressed disgust that the image is being openly celebrated whilst many are worried that the negativity of the image paints a terrible portrait of Britain today to the rest of the world. Here’s what I think, personally. Firstly, how refreshing for a single frame to receive such publicity and attention in the media, regardless of its content. As a photographer I have come across so many people who believe that photography is not a true profession and requires little skill because anyone and everyone can take a picture on their camera phone. Whilst listening to Vine’s feature on the radio my initial feeling was of optimism. The fact that a photograph and its creator was being discussed and debated in such a way meant that a photographer was being given recognition for achieving something that not just anyone with a camera phone could. It highlighted that to be a professional photographer required skill, intelligence and creativity. It is fair to say then that I do not have particularly strong feelings about the content of Manchester New Year’s Eve picture. I actually had stronger feelings towards other people’s reactions to the image, some of which I found absurd. 1. ‘The photograph is a negative portrayal of Britain to the rest of the world and should not receive such coverage!’ I’m not sure that anyone could argue that this is a positive image but unfortunately, it is reality. Baring in mind that alcohol misuse costs England £21 billion in healthcare, crime and lost productivity each year and that 9 million people in England consume more than their recommended daily intake of alcohol it is fair to assume that this image is not a one-off. Never mind that the image was taken in Manchester, we all know it could be any city in Britain today; be it Glasgow, Cardiff or Liverpool. This isn’t a photographer fabricating a story or setting up a scene. It’s a documentation of reality, exactly what a photograph by a News Photographer (as Goodman described himself) should be. What annoyed me more about this point of view is that the emphasis is upon the fact that because of the negative content the image it shouldn’t receive such coverage. So it’s okay that its happening, just so long as the rest of the world doesn’t know about it? 2. ‘You shouldn’t photograph and publish images of people who are in a vulnerable state without their permission!’ This is a tricky one, because the law states that ‘Photographers are free to use their photographs of people taken in public places as they wish’. It is clear though that this point of view is coming from a moral perspective rather than an issue of legality. One particular post I read on the blog ‘Stars and Spirals’ centres around this opinion and in the closing summary of the blog post, states that:“There could be a lot of reasons a person has ended up in that situation; alcoholism, spiked drinks, trauma”. This is an indisputable statement. It is, however, the nature of this genre of photography. We don’t know the life story of every person in every street photography image ever shot, if we did I believe it would somewhat ruin the magic of the genre. I am of course sympathetic to the issues outlined by the blogger but firmly believe that this, as a reason not to take the photograph, is being too sensitive. Should Goodman really have thought twice about lifting the camera just incase those people were alcoholics or had been spiked? 3. ‘I can’t believe people are celebrating the perfect composition of such a scene!’ This one really got me. The composition and content of a frame are two completely different things to be celebrated in completely different ways. There are images throughout history which have been celebrated for their originality, creativity and compositional merits which depict scenes of war, famine and death. In no way does that means that we are celebrating war, famine and death! Such a ridiculous comment requires no more dis-accreditation. So there’s obviously plenty of negatives in regard to the content of the image, but what about the positives? It is fair to say that the image has drawn our attention to the huge issue of binge drinking in our society today. Whose to say that people haven’t looked at that image and seen themselves? It could be argued that the image will open people’s eyes to the ways in which they may be perceived when intoxicated and their vulnerability in such situations, thus educating a portion of the population about the risks surrounding their overindulgence in alcohol. It’d be great to hear what everyone else thinks about the image and people’s reactions to it. Does it remind you of a Renaissance Masterpiece? Are you offended that it received such coverage? 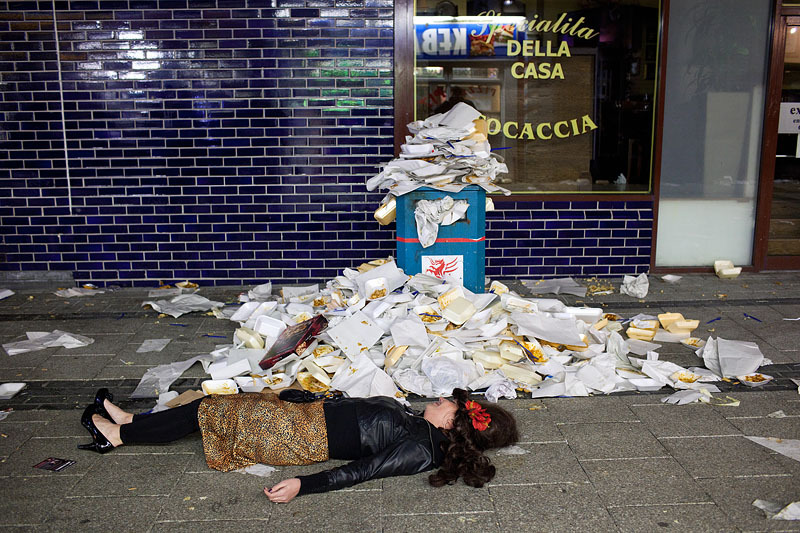 Is it wrong to photograph drunken foolery on the streets because of the vulnerability aspect?